Wi-Fi (WiFi) is the technology that allows you to connect your Computer, Mobile phones, iPods to the internet anytime and anyplace like at a home, Office or Streets. Unlike Wired Internet connection, you don’t need any cables to connect to Internet. However Wired networks are very safe to connect to internet, it’s because no one can access your internet connection since it is directly connected to your ethernet port. But wireless network is using the Wireless signals to connect with Internet. So it can be easily accessed by your neighbours and by Hackers. Also, Web pages that use SSL are secure but unencrypted internet access can easily be detected by intruders. The Good news is that You can secure your WiFi connection to prevent those access and stealing your passwords over the Wireless connection. Here are a few tips for keeping your network and your data safe from Hackers and Intruders. Open your router settings page in your browser by entering 192.168.1.1 or something similar. Read the owner’s manual of the router to know about the router and to get default username and password. Most Router manufacturers use something like username = admin, Password = 1234, so you should change. If you don’t have the manual, then read it from your router manufacturer site. Here is the most popular router Manufacturer support links Linksys, Cisco, Netgear, Apple AirPort, D-Link, Belkin, Buffalo, TP-LINK, 3Com. SSID is the Wireless network name. The SSID differentiates one WLAN from another and have the pre-defined names set by router Manufacture like “Linksys” or “D-Link” . Your wireless router will broadcast those SSID details in air for other devices lock onto. So it will expose your router name to other wireless users.So those users can access your wireless network by entering the default password and username of that router, If you haven’t changed your default username and password before. To prevent this, you can disable the broadcast of your SSID details from your router settings page. So your neighbours won’t know about your network details anymore. Still there is possible to find your SSID details using some free Wi-fi scanning tools like inSSIDer (Windows) and Kismet(Mac, Linux). So that, you should change your wireless network name (SSID) in the settings page to prevent others to get some basic info of your router. Each your computer and Mobile phones with Wi-Fi have unique MAC address. This is actually a physical number assigned to the every Network adapter hardware (Wi-Fi or Ethernet). You can use this MAC Address to protect your Wireless network. To do this add all of your devices MAC addresses to the Router settings page. Except your devices,this setup prevents to connect any other device having different MAC address to your Wireless network.Since MAC address is unique and assigned in Hardware, any other computers or phones can’t access your Wireless Network. To find a MAC Address of your computer Wi-Fi adapter, Open Command prompt (Win +R and type cmd) and type ipconfig/all. This command will show your all MAC addresses(Physical address) of the network adapters. There you can copy the MAC address of the Wi-Fi adapter of your computer. To find the MAC address of your Wi-Fi phone, Go to network settings and find it there or something similar settings. Just collect all your devices MAC addresses that you want to connect to your Wireless network and enter it in the Wireless router settings. It is possible to change the MAC address on most modern hardware which is MAC Spoofing. By using this technique hacker or intruder can change their device’s MAC address to your device Address and can access your Wireless connection. To use this technique intruder needs your MAC address. Unfortunately, there is some third-party Wireless sniffing tool like Nmap to find your MAC address. The Intruder also can change their computer’s MAC address using tool like MAC Shift. Wi-Fi encryption was designed to protect against snooping your wireless network. The basic encryption method is WEP (Wired Equivalent Privacy). Since it is easy to hack, WPA encryption mechanism introduced. WPA is secure than WEP, though it has some security vulnerabilities. However it supports most old hardware equipments. Then WPA2 is introduced in 2004, it is the best secure encryption mechanism prevents any snooping, and it supports all new Wi-Fi devices. To encrypt your Wireless network, Go to security settings in the router settings and choose the WPA2 encryption method or WPA or WEP. Then enter the most complicated passphrase(combination of alpha-numeric words) to access the network. The free third-party tools like AirSnort or Aircrack-ng can quickly recover WEP encryption keys using brute-force and dictionary attacks. Currently the 802.11 has three distinctive Frequency ranges such as 2.4 GHz, 3.6 GHz and 4.9/5.0 GHz bands. Each Frequency range has some multi Wireless channels which has different signal strengths. The 24.GHz range has the (802.11b/g/n) Wireless channels. 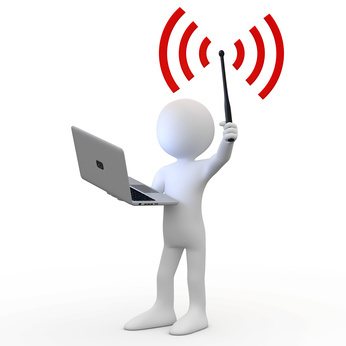 You can choose 802.11n or 802.11b instead of 802.11g to reduce the range of signal strength. Otherwise, you can put the router in the closed room or something like this to suppress the signal strength. These steps will protect your wireless network, data and your privacy from hackers and other intruders. Now your Wi-fi connection is highly secure and it will take ages to hack your wireless connection if you have followed the above steps.